The trailer for Joker dropped today, so what better time to take a look at its spiritual predecessor, The King of Comedy? Martin Scorsese’s criminally overlooked 1982 box office bomb brought in a paltry $2.5 million on a $20 million budget ($6.5 million and $52 million when adjusted for inflation), and it is understandable the movie hasn’t stuck to the public consciousness as much as Raging Bull or Taxi Driver have, if only because it ended up being flatly ignored. Now, with Scorsese producing and Robert De Niro co-starring in Joker, The King of Comedy is ripe to being appreciated for the strange, black comedy it is. We follow De Niro’s Rubert Pupkin, a man as obsessed with late-night host Jerry Langford (Jerry Lewis) as he is with becoming the new king of comedy. Managing to finagle his way into Langford’s limo after a show, the host, seemingly more than used to dealing with wannabe performers, gently pushes Pupkin aside with promises of listening to tapes of his performances. Send them to my producers, is something most of us will accept as a brush off; Pupkin takes it as a guaranteed promise he’ll be on the show. Of course, the self-proclaimed comedian doesn’t have any tapes—he has never performed his act outside of his mom’s basement. There he has a fake talk-show set where he yucks it up with Liza Minnelli in front of hundreds of fans. For Pupkin, there is no separation between reality and fantasy. If it happens in his mind, it is the truth. Pupkin is not a sympathetic character, and he can’t blame his behavior on having been dealt a bad hand in life. He has a good job, and his mom, from what we hear from her, sounds like a reasonable woman. The fact that he’s thirty-four and lives in her basement says more about him than anyone else. Pupkin feels he deserves to reach the top without working for it. You gotta start at the bottom, Langford says, to which Pupkin responds, well, I’m already here. As reality and fantasy start melding, Pupkin’s behavior becomes unhinged. After convincing a girl he is personal friends with Langford, the couple shows up at the host’s weekend house for a dinner party that only was to take place in Pupkin’s head. Soon, it becomes apparent even to Pupkin that he never will get a shot at performing, which leads him to the only logical next step: to kidnap Langford, and force the producers to put him on the show. The King of Comedy is darkly funny. You won’t laugh out loud, but De Niro, Lewis, and a young Sandra Bernhard, nail their roles. Jerry Lewis is best known as the over the top comedian who inexplicably hit it big in France (and in my household growing up), but with The King of Comedy, he shows restraint and menace. His character clearly is a jerk, and no matter how off-kilter Pupkin is, it’s hard to show Langford much sympathy. Lewis’s input to the movie was significant, from improvising scenes with De Niro to directing a scene, and even naming his character. Going by Jerry, the crew could stealthily film him walking down the street, people cheering his (and his character’s) name as he passed by. The movie is cleverly edited, and it’s hard to know what is real and what is happening in Pupkin’s head. The last few scenes are entirely up to your interpretation. What actually happened to Pupkin? Is what we’re seeing fantasy or reality? I truly enjoyed The King of Comedy, and consider it Scorsese’s finest work. It’s a fitting companion piece to Taxi Driver—Pupkin and Travis Bickle both lack a grip on reality—and it will be interesting to see if Joker falls in line like many of us expect. 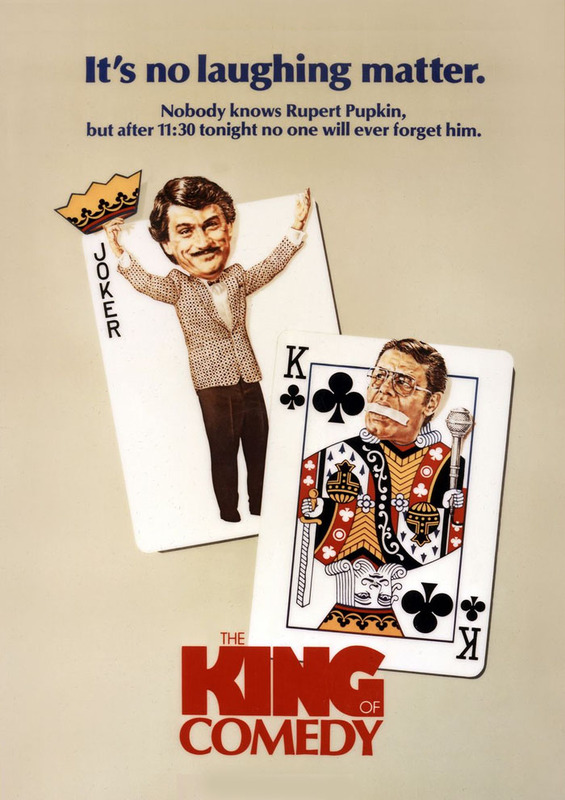 The King of Comedy, meanwhile, is a classic all on its own, and it’s streaming for free on Prime right now.